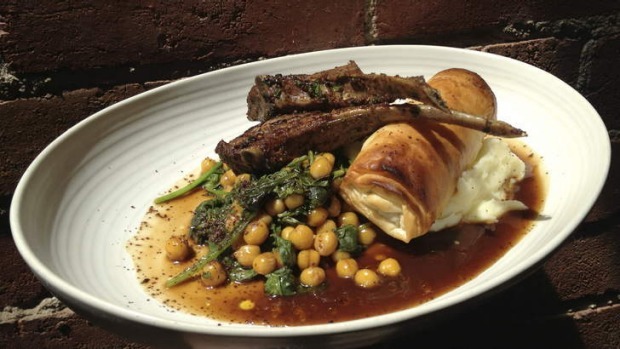 Lil Boy Blue's 'lamb two ways'. No, you haven't had too many Tsingtao beers - your mouth really is detaching from your face. At least, that's the peculiar sensation experienced when tucking into Dainty Sichuan's cumin lamb slices, seasoned with mouth-numbing Sichuan peppercorns. Tender, meaty slices of lamb are tumbled in a smoky wok and seasoned liberally with aromatic cumin, chilli and Sichuan pepper. Team them with another authentic Sichuan delight such as pickled snake beans, tossed with their emerald-green fresh counterparts and pork mince. Dainty's new CBD premises are slick and modern, with nooks for private dining. Watch out for a third branch, to open soon in Box Hill, specialising in hot-pot. 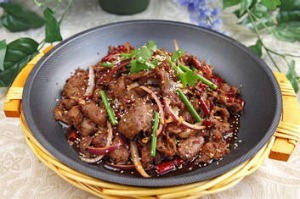 Dainty Sichuan Food, 176 Toorak Road, South Yarra, 9078 1686 and Level 2, 206 Bourke Street, city, 9650 2188; $28.80. Growing up, there was no boring muesli bar waiting for Rosalyn Manno when she got home from school. Instead, her mum would lovingly press spiced lamb mince onto pita bread and grill it for a warming afternoon treat. Here at Nabiha, Manno's childhood memories are at play in her version of the Lebanese classic lahm bi ajeen. A Lebanese pizza base is smoothed with lamb mince, spiked with tomato and onion, and dressed with lemony sumac and rocket leaves. Spring for a side of creamy labne to offset the heady spiced lamb flavours. Nabiha is a gem in otherwise strait-laced Moonee Ponds, serving up two custom coffee roasts by Five Senses on a fully manual Synesso machine. Nabiha, 10 Hall Street, Moonee Ponds, no phone; $12. Presiding over his eponymous kitchen tucked down a sleepy side street, Sanjeev Mishra is a delightful host. His specialty is a lamb shank curry, inspired by his mother's Rajasthani heritage. Shanks from the butcher two doors down are marinated in a paste of ginger, garlic and spices. They're placed reverentially in a large pot that's sealed with dough and left to bubble on a gentle heat until the meat falls from the bone. Ring ahead to check they're on, but if they've proved too popular try the lamb madras, a southern Indian curry crafted with mustard seeds, curry leaves and coconut milk. For afters, don't miss house-made mango kulfi or gooey chocolate-stuffed naan. Mishra's Kitchen, 18 Wembley Avenue, Yarraville, 9314 3336; mishraskitchen.com.au, $15. Dainty Sichuan's cumin lamb slices. Its namesake might have been snoozing on the job, but Kew's Lil Boy Blue is seriously switched on. The ''lamb two ways'' sees lamb shoulder braised for seven hours with thyme, bay leaves and lemon zest before being shredded and parcelled up in filo. It cosies up to two juicy cutlets marinated in tangy chermoula. Goat's cheese and potato mash plus a light braise of chickpeas and spinach complete the picture. Lil Boy Blue is an all-day affair, where breakfast tacos and great Allpress coffee segue into little and big plates at lunch and dinner. Chef Josh Clarke, formerly of Estivo and Centonove, has created a fresh-faced destination for the suburb. Lil Boy Blue, 309 High Street, Kew, 9853 5003; lilboyblue.com.au, $36. Abdul Hussen and Rozenn Blouin wanted to create a space for people to gather in Footscray, and gather they do. Indeed, it's hard not to with the carefully crafted and delicious Ethiopian fare on offer, particularly the lamb tibs. Tender lamb pieces are sauteed with onions, tomatoes, green chilli and berbere. This magical red powder, imported from Ethiopia, contains about 25 individual spices. Konjo also specialises in coffee, serving a certified organic, single-origin bean from Jimma in Ethiopia. Try it in an espresso or brewed Ethiopian-style ($6.50 for a small pot). Keep an eye on Konjo's shop in Smith Street, Collingwood, soon to reopen with a full Ethiopian menu. Konjo Ethiopian Restaurant, 89 Irving Street, Footscray, 9689 8185; $12.